Red, yellow, green and blue that break into silver fish and comets, this stunner provides something for everyone. The finale features overlapping bursts of sparks and crackles, which will show you are serious about a great display. 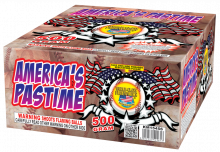 Long lasting with a spectacular finale – lots of fun to watch! $109.99 Buy 1 Get 1 Free!